Designed with a classic look and a few holiday accents, the baseball personalized Christmas ornament is ideal for softball players too! 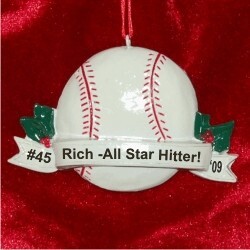 These are quality resin sports ornaments personalized in a hand-lettered font with the details you provide. Extras include our convenient display cord and exclusive velvet gift and storage bag. Encourage your young player to reach his or her peak with the softball/baseball and banner personalized Christmas ornament that is just about the size of a standard ball! Christmas gift for Grandson Oct 4, 2015 Jody T.